Following ‘Sink II’ the artefact ‘Anatomical Deconstruction V’ de-emphasises processes of making by further abstracting forms. The work thematises anatomical references in association with found objects. Sheet glass is assembled in a deliberate low-tech manner to create precarious supporting structures for utilitarian ceramic fragments. ‘Wilful amateurism’ is employed to achieve spontaneous outcomes which placing the concept at the forefront of the work. The theoretical validity of non-technical approaches is made most apparent as the glass responds directly to the broken ceramic. 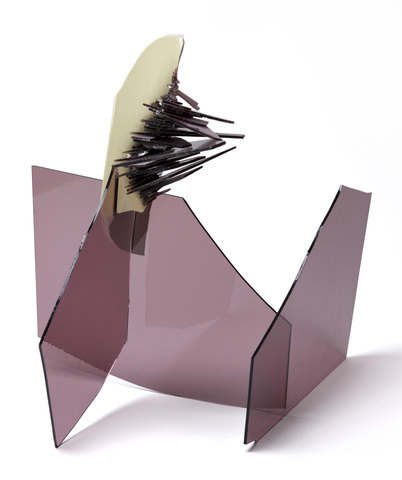 This artefact was included in New Glass Review 34, published in spring 2013, an annual survey of contemporary glass undertaken by The Corning Museum of Glass, Corning, USA. 1,010 individuals and companies from 48 countries submitted 2,973 works, the 100 objects featured in the review were selected by an international jury of four significant curators and artistic directors in the field of glass, including the curator of Modern Glass at Corning Museum, US. The jurors stated that they were most interested in work evincing conceptual thought over physical materiality and/or technical processes. Only four other British artists were featured. Images of this work are held in the Rakow Research Library and are available to the public online.